When we organized the chocolate tasting story that ran in last week's paper, we weren't able to try every chocolate we wanted. One emerging chocolatier whose work we'd hoped to sample was Warren-based Quayl's Chocolates. Unfortunately, Quayl Rewinski didn't have any for sale in the Burlington area at that time. To make it up to us, she brought a special early Easter delivery to the Seven Days office. 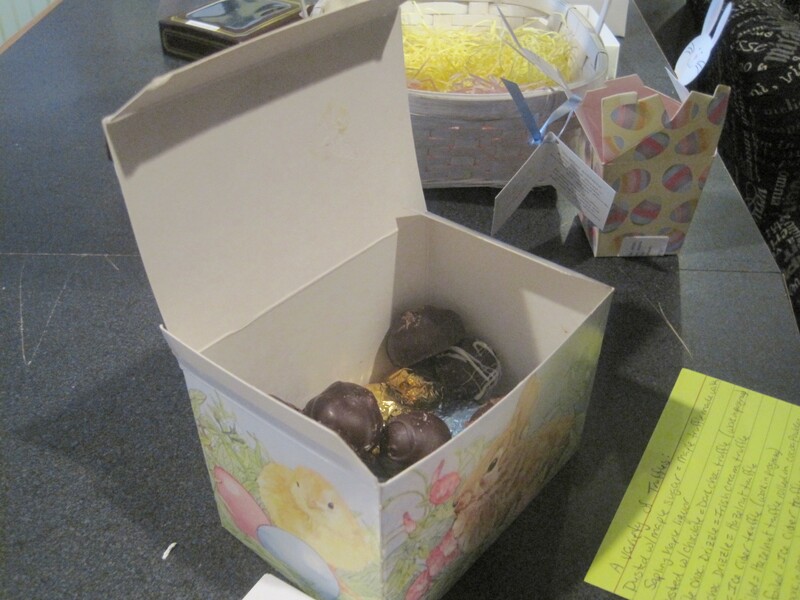 Rewinski personally delivered a slew of treats, including an Easter basket filled with yellow and pink "grass." I wish I'd had time to photograph the array before our staff dug in, but the table full of yummies proved too alluring. The verdict: Quayl's was one of the best of the state's new chocolate makers. Rewinski brought along not only established treats such as a suitably buttery butter crunch and truffles filled with Sapling Vermont Maple Liqueur, but also some experiments. Ice cider truffles betrayed only a hint of tangy apple in their finish, but were far more popular among our tasters than the version we tried in our recent story. The truffles' thin jackets and melting centers had just the texture we'd been looking for. I'll keep my eye out next time I'm in the Mad River Valley, or hope that her sweets return soon to the Burlington Farmers Market or Logan's of Vermont in Burlington.